Striking from the day of birth, for her length of body and exquisite dairy character, we named Sharon’s beautiful 2009 doeling Caliente, as we were confident that she would be “hot”! As a single kid, “Callie” weighed 12 lbs. at birth, and has continued to show her dam’s width and depth of body, along with her sire’s sharpness and stature. Shown three times as a kid, Callie placed first every time, and went Reserve Junior Champion twice, including at the large Southern VT show. On the day of appraisal, the appraiser stated, “this one will be your Best in Show doe!” At the first show of the 2010 spring season, Callie placed 1st and Junior Champion, earning her dry leg. She is a very powerful doe, extremely tall, long, wide and level in the rump. In the spring of 2011, Callie freshened with an absolutely gorgeous mammary! She has a very high, arched rear udder and a fore udder which is well extended and perfectly blended into the abdomen. Shown twice, she went 1st and GCH both times, becoming a finished Champion as a first freshener!! In one of these shows, she won the Champion Challenge class over three GCH competitors. She now tapes at 190 lbs., and has an ME of 3636 lbs. She is a dream to hand milk., and almost certainly my favorite doe in the herd! 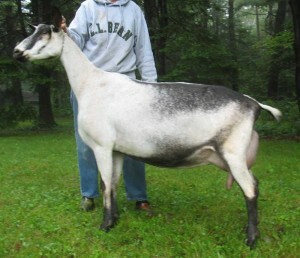 Callie is the third GCH daughter of SGCH Rose of Sharon in the current herd; what a doe line this has been! Freshening again in 2012 with a single buck kid, she did not milk as heavily as we would have hoped. However, we were thrilled when she scored a 44 in rear udder height and a 43 in fore udder attachment! In 2014 she attained a permanent appraisal score of 91 (E E E E). Her 2012 buckling is now in Quebec; a very impressive and powerful young buck, we repeated the breeding in 2013 and again in 2014. Her twin bucks born in 2013 are now working in Massachusetts and Wisconsin. Her 2014 twin bucks reside in Maine and in the Breezy Way Farm in PA. Her 2015 buckling, Clementi resides in PA as well. As Callie has had very significant difficulty following her kiddings for the past three years, we have decided to retire her. This has been a hard decision, but we think best for her. We will retain her very pretty and structurally correct doeling, Celeste, by Corelli.